A Note from Clara Johnson Scroggins indicates only 50 of this ornament were produced. Making it the RAREST OF ALL THE MAYORS TREE ORNAMENTS. When the 2006 Value Guide was being prepared, a nationwide search for a picture proved that very few are out there! The Mayor’s Christmas Tree, located on Crown Center Square, stands as Kansas City’s official Christmas tree. It’s also a symbol of a citywide holiday charity, the Mayor’s Christmas Tree Fund. The Mayor's Christmas Tree has been a Kansas City tradition since 1908. Mayor Thomas Crittenton initiated the project, erecting an official city tree at City Hall and established a fund drive. During his term, more than 8,000 needy children were cared for by what was then the Mayor's Municipal Christmas Tree Fund. As the years went by, the program grew and since 1973 the tree has been in Crown Center Square. The purpose of the tree remains the same; however, to solicit funds to serve Kansas City’s needy, elderly, and the forgotten during the holiday season. Money donated to the Mayor's Christmas Tree Fund will buy clothes and food for needy families, gifts for elderly shut-ins and hospitalized patients, parties for impoverished children and more. 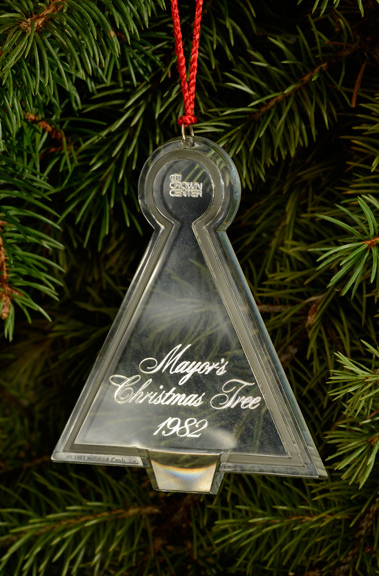 From 1981 through 1986, Mayor’s Christmas Tree commemorative ornaments were designed from the Hallmark ornament line, but revised in limited editions with the Mayor’s Christmas Tree inscription. Since 1987, the ornament has been a completely unique ornament, designed by Hallmark artist Fayrol Unverferth and made from the wood of the previous year’s Mayor’s Christmas Tree.